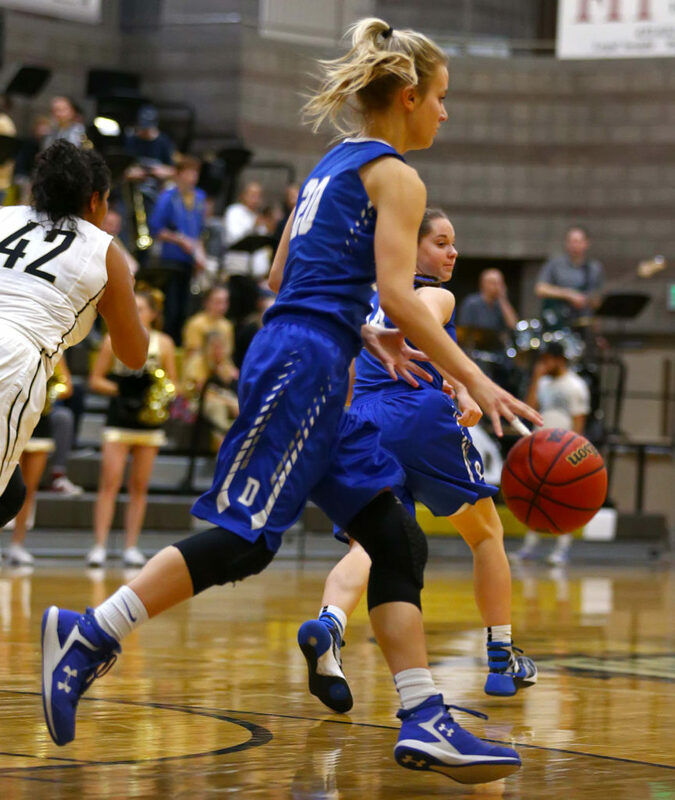 The Lady Flyers struggled all night against the pressure defense of Desert Hills. Offensively, they got few shots, and the few they had were not high-percentage shots. 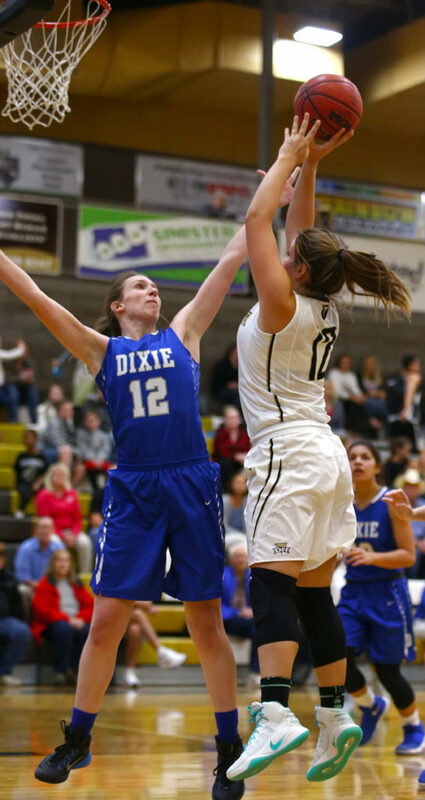 But on defense, Dixie kept the home-team Thunder in check through most of the first half. 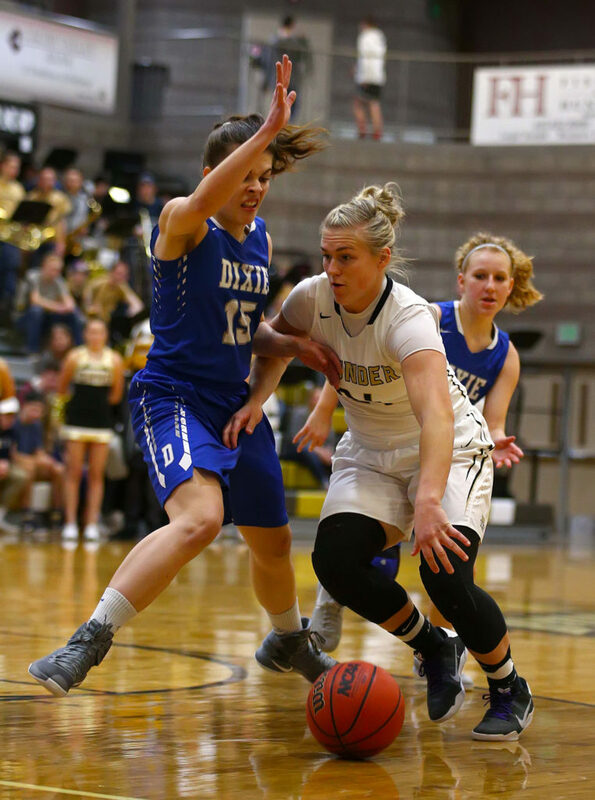 However, an overwhelming third quarter put the game out of reach and Desert Hills played bench players and coasted in the fourth quarter for the 68-28 win. Desert Hills put up the first nine points. Ashley Beckstrand either scored or assisted on the first four baskets. 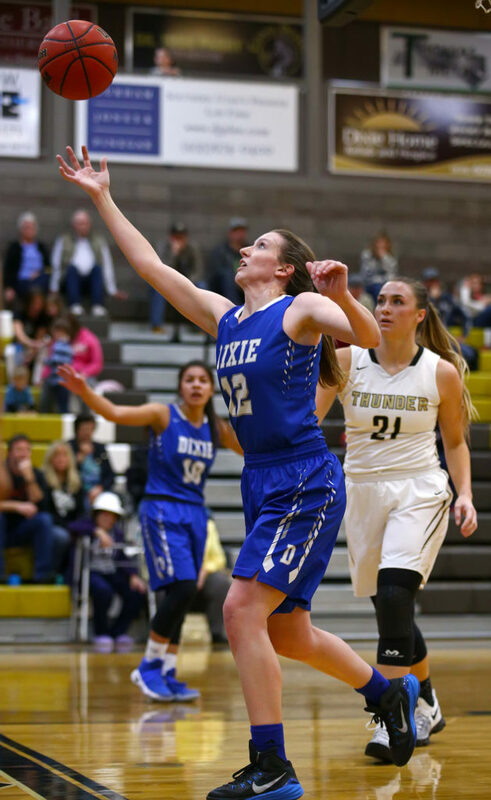 Dixie’s Grace Killian and Sina Schwalger then each nailed a 3-pointer to pull the game to 9-6 at the two minute mark of the first. But the Thunder scored three consecutive baskets to end the period with a 15-6 advantage. 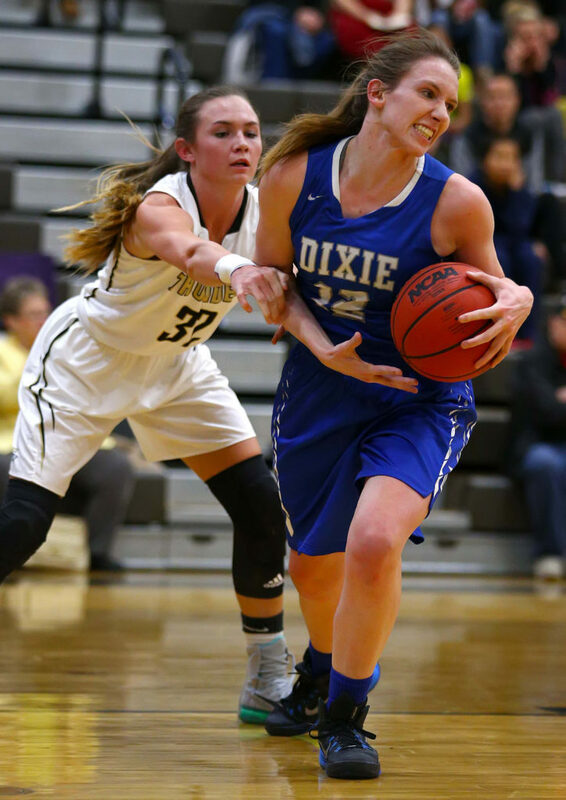 Dixie’s Kelsea Barker started the second with two baskets, the first a 3-pointer from the right wing, to pull the Flyers to within 15-11. Beckstrand and Jess Mathis then hit back-to-back 3-pointers. 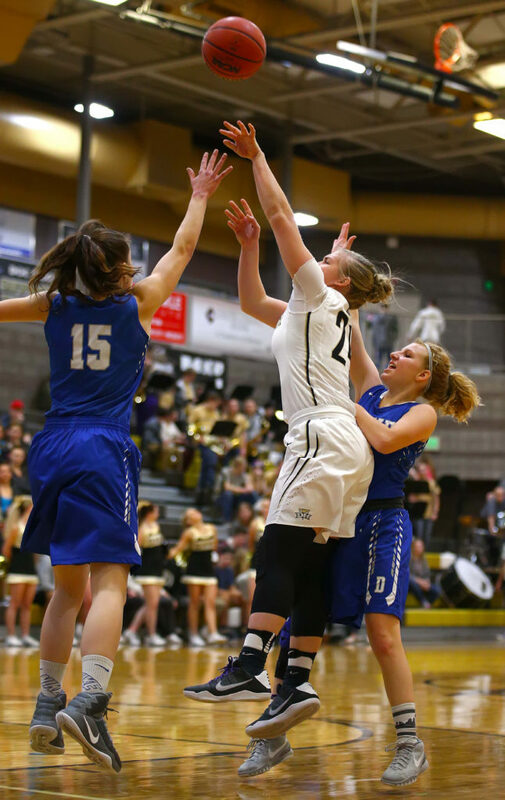 Morgan Myers got a steal and quick basket on the press to give Desert Hills a double-digit lead, 23-13, with two minutes remaining in the half. Mathis nailed another trey to end the half and give the Thunder a 29-16 halftime advantage. Denos said rebounding helped keep Dixie in the game in the first half. Coming out of halftime, the Lady Thunder turned on the jets. Desert Hills started out the half with the first 20 points. Seven different players scored during the run. But a majority of the points came off turnovers by the Lady Flyers. Dixie ended the run with a Schwalger steal and fast-break layup. It would be Dixie’s only points of the quarter as the Thunder closed with three consecutive baskets and a commanding lead of 55-18 to begin the fourth. Denos put in several reserves shortly after the fourth quarter began and played Dixie to a draw toward the end. The Thunder outshot Dixie 49 -21 percent from the floor. They also held a 37-30 rebounding edge and forced the Lady Flyers into 26 turnovers. Individually, Beckstrand led all players with 15 points. Mathis scored eight and Jess Bills scored seven. For Dixie, Barker led the team with 10 points. Schwalger scored seven. The Thunder improve to 9-3 overall and 1-1 in Region 9. They will host Hurricane on Tuesday night. Dixie falls to 4-7 overall and 0-2 in region play. They will host Snow Canyon on Tuesday. After a first quarter draw, the Lady Reds used the next two quarters to put the game out of reach. While the Lady Warriors outshot Cedar 36-35 percent, the home team took 15 more shots from the field and were very accurate from distance, hitting 7 of 14 shots. All in all, the Lady Reds outscored Snow Canyon by 16 from the field. The extra shots came from Cedar’s offensive rebounding and forcing Snow Canyon into 15 turnovers while committing only seven. The Reds also held the opposing team’s leading scorer far below her average for the second consecutive game. 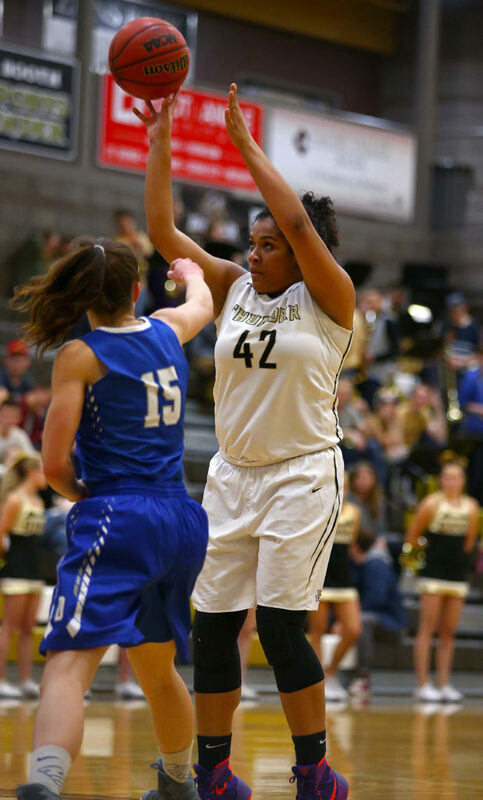 After shutting down preseason Region 9 Player of the Year Ashley Beckstrand Tuesday night, the Cedar defense held Snow Canyon’s Jasmine Lealao scoreless. Individually for Cedar, Dream Weaver led all players with 15 points. Maisie Elison joined her in double figures with 10. Emily Pearson led the Reds with eight rebounds. Weaver also led the team with five assists and three steals. 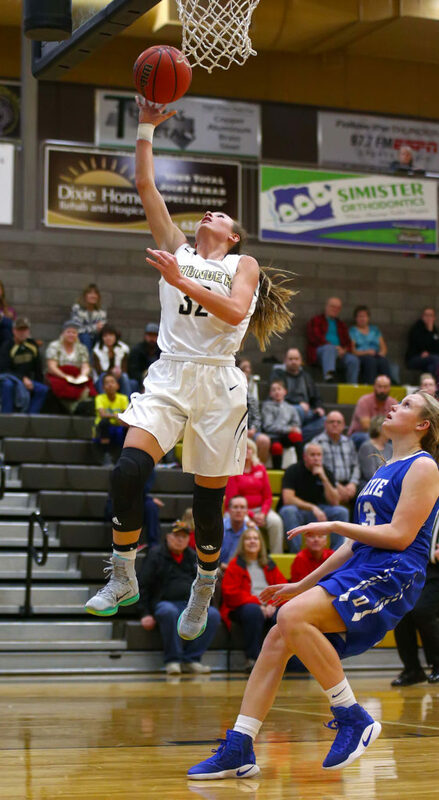 For Snow Canyon, Tylei Jensen had eight points. Lindsy McConnell added seven. Cedar takes over sole possession of first place in the region with a 2-0 record and an overall record of 11-2. The Lady Reds will travel to Pine View on Tuesday night. Snow Canyon falls to 8-5 overall and 1-1 in the region. The Lady Warriors will travel to Dixie on Tuesday night. 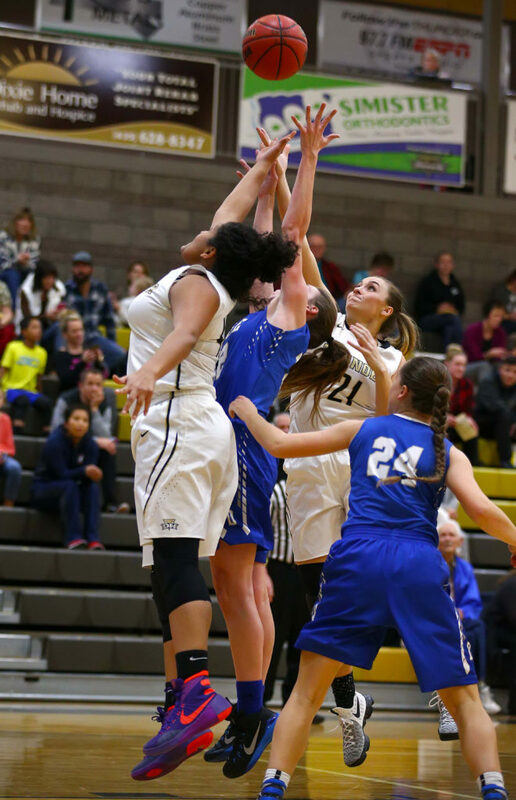 Pine View bested the Lady Tigers by a single point in the first quarter, but slowly added to it to take a double-digit lead into the fourth quarter. The Lady Panthers again used gritty defense and rebounding to pull out the win. While Hurricane outshot the visitors 26-23 percent, Pine View outrebounded the Lady Tigers 32-23, including getting 16 offensive rebounds. That advantage gave Pine View 10 more shots at the offensive end. Pine View also outscored Hurricane at the line 18-11. 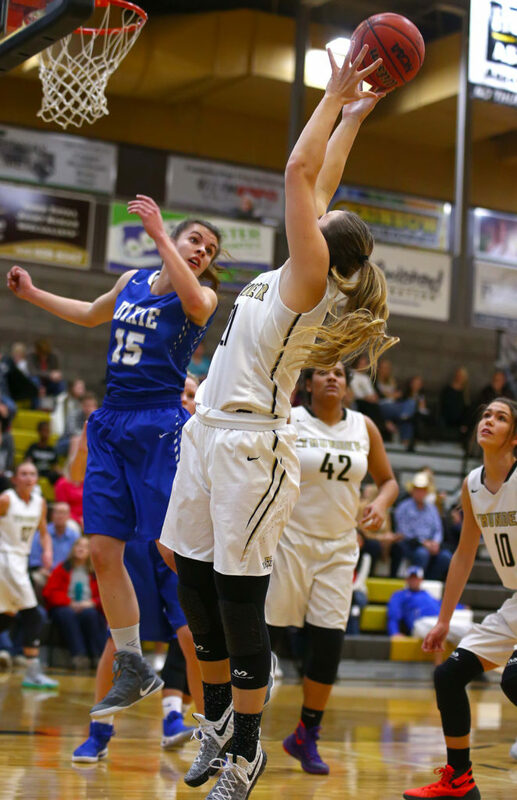 Pine View was led in scoring by Claire Newby with 20 points. Newby also led the team with nine rebounds. Saraven Allen scored 13. Leiani Tonga had seven points and seven rebounds. For Hurricane, Jayden Langford had a double-double with 11 points and 10 rebounds. She also had four steals. Madi Hirschi had eight points and four steals. Alexa Christensen had seven points and six rebounds. Pine View improves to 4-5 overall and 1-1 in the region. The Panthers will host Cedar on Tuesday night. Hurricane falls to 8-5 and 1-1 and will travel to Desert Hills on Tuesday night.